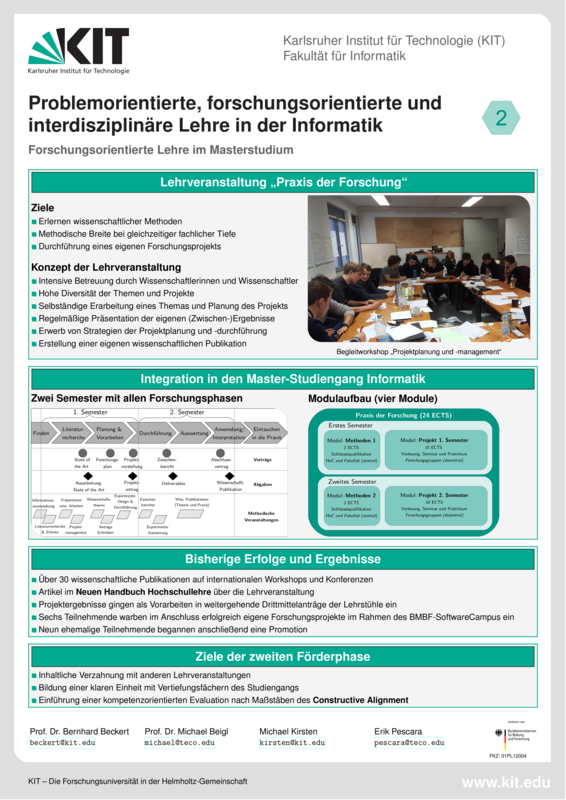 LehreForschung had a significant and leading influence on the development of the guiding principle of KIT regarding teaching and curricula. It contributed to the successful installation of a system-accredited process for the quality development of the KIT-curricula. The study and learning formats which immediately emerged from the project achieve a high acceptance among the students and have already been permanently integrated in individual study programmes. 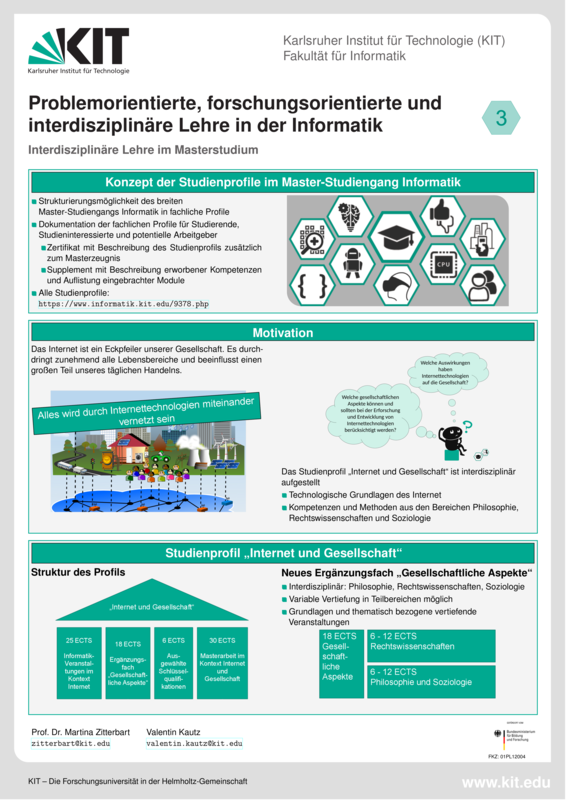 The main goal of the project LehreForschung-PLUS is furthermore to improve the study conditions and to continuously raise the qualitiy of teaching by an extensive development of the curricula. This project is the second funding period of its predecessor LehreForschung. The successfully implemented actions of the first funding period include in particular new lecture concepts in the form of projects and practical courses, which enable early insights into research-relevant questions. Our subproject comprises the following three actions, which all aim to implement and strengthen project- and research-oriented, as well as interdisciplinary, teaching in the computer science curricula. The objective for the master programme in computer science is to further develop and to improve the master module "Research Project" (PdF). In this module, each student works on a research project for one year and experiences all research phases of this project. From literature research to planning and writing a project proposal, including performing research in the scope of the project and writing a publication in order to publish their results. The projects are performed on topics within current research projects. The programme is very successful so far: Since its start, a number of papers partially or fully covering the student research projects have been successfully published. The integration of PdF in the curriculum is to be rearranged and improved regarding contents and organization, such that PdF forms a clear unit together with the remaining range of courses in the areas of specialisation, and that the so far existing hurdles for participating in PdF will be dismantled. The objective for the bachelor programme in computer science is to further develop and improve the project-oriented course "Software Engineering Practice". Students participating in the course "Software Engineering Practice" learn to perform a full software project according to the state of software engineering in a team of 5 to 6 participants. Particular goals are the practical application of procedures from software design and quality assurance, the realization of implementation competence, and the collaborative cooperation in teams. Prospective task definitions are to be chosen in such a way that their results will either be used in research projects of the supervising research group or establish foundations for them. Thereby, students are given direct insights into ongoing research projects and, early in their curriculum, they are introduced to topics, methods and problems of current research activities. The objective for the master programme in computer science is to introduce interdisciplinary research-oriented teaching with the focus "Internet and Society". The teaching both orients itself towards interdisciplinary research and is itself interdisciplinary. Here, on the one hand, teaching throughout multiple departments is to be advanced, as well as, on the other hand, advancements towards goal-oriented integration of the large-scale research sector are to be made. Specifically, a profile "Internet and Society" shall be defined, which forms an additional qualification for graduates. It furthermore certifies to have completed a special orientation with topics in the areas internet/networks, security and privacy etc. and a complementary subject "Technology and Society", as well as to have produced a master thesis in the interdisciplinary area with a suitable problem task. 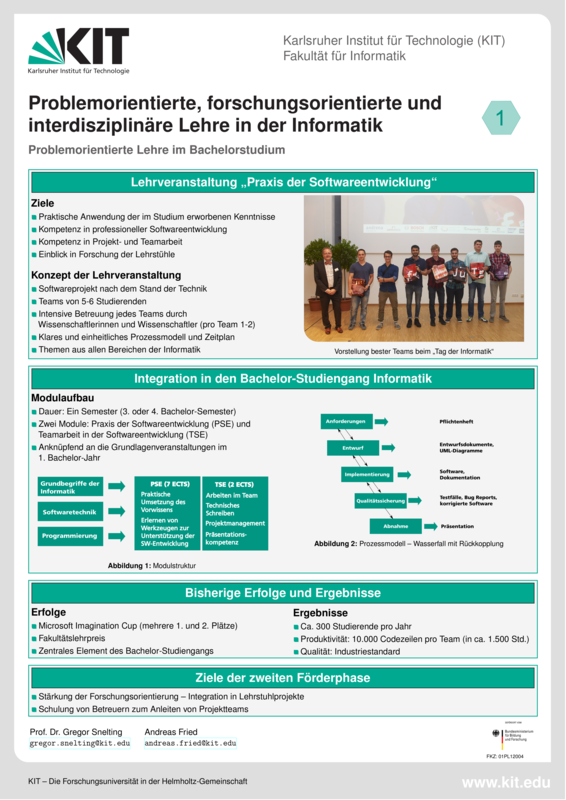 More information on the master module "Research Project"
More information on the bachelor module "Software Engineering Practice"
There has been a number of papers published, which are partially or fully covering the student research projects in the master module "Research Poject". They are listed on a separate page. as part of the programme Qualitätspakt Lehre – a joint programme of the federal and state governments for better study conditions and more quality in teaching.